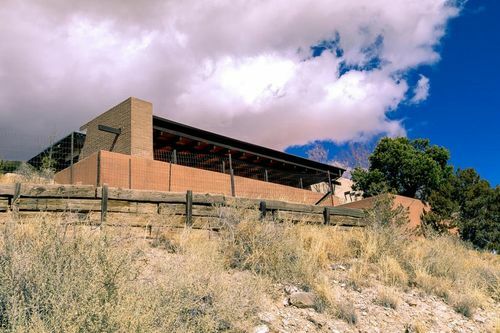 Quintessential Placitas located on 4+ acres (on 2 lots) overlooking the Sandias. Mid-century modern flair with big mountain views! The home has many unique features & upgrades throughout, including recently restored brick floors, beamed ceilings, nichos & built in shelving units, combo refrigerated air/heating unit, 2 wood burning fireplaces & 1 wood/coal burning stove, electric baseboard heat, newly installed septic system, newer hot water heater, Andersen wood windows & solid wood doors. The kitchen features expansive engineered granite counters, Heartland gas/electric stove, s/s dishwasher & fridge, built-in storage & a large pantry. Adjacent 2.761 acre lot available for purchase for $35k. Pre-inspected & repairs complete!